pipe cleaners and googly eyes. : Where Is My Mind? Emerging from the main Dhamma Hall with intense pain in both of my knees, I join the rest of the guys as we ‘walk’ like windup toys, only being able to lift a non-bending leg mere inches off the ground, as we shuffle along the short walking path. 4.00am:	Morning Wake Up Bell. 4.30-6.30:	Meditation in Hall or Residence. 8.00-9.00:	Group Meditation in Hall. 9.15-11.00:	Meditate in Hall or Residence, As Per Instructions of Teacher. 1.00-2.15:	Meditation in Hall or Residence. 2.30-3.30:	Group Meditation in Hall. 3.45-5.00:	Meditate in Hall or Residence, As Per Instructions of Teacher. 6.00-7.00:	Group Meditation in Hall. 7.15-Until Complete:	Goenka Video Discourse/Dhamma Talk. 5min after Completion-9.00:	Group Meditation in Hall. At first I felt like this course was going to be like ‘meditation boot camp’ rather than the common negative internet comparisons of the course being run like a cult. I am happy to say that I now disagree with both. The absolute rules for the code of conduct; following the 5-precepts (8-precepts for returning students); obeying the noble silence; segregation of the sexes; no dinner (snack and chai available for new students, only); no reading or writing; the ceasing of all other meditation techniques and agreeing to practicing only what is taught; and the agreement of staying for the full length of the course, are all set up for a reason…[To remove all potential distractions that could prevent the student from calming the mind]. I’ll admit [though], as I was signing the form of commitment, that I was feeling a little… intimidated. Leaving the grown comfort of Ao Zora and the simple life of Bodh Gaya behind, I rode the auto rickshaw 7km towards the last adventurous leg of my trip, ten-days of observing how my conditioned mind is subject to fear, anger, craving, aversion, and other intense emotions and learning to calm it through Vipassana Meditation; a technique and method taught by Gautama Buddha through the process of seeing things as they really are, impermanent and always changing, bringing self awareness by simply focusing on the natural breath. I started meditating at Dharma Punx back in 2005; practicing the Buddhist philosophy has had such a profound impact on my life and has motivated me to read so many Dhamma books and to see how it all applies to the busy New York City life. The Vipassana Meditation technique has intrigued me so much, particularly through my experience, but additionally learning how it has helped so many other people. Upon arrival, I was caught off guard by how many Caucasian people there were, at the registration hall. I suppose I never gave it much thought at all, as to where people would be coming from. We all quickly began going around introducing ourselves, where we were from, where we’ve been on our travels, and how long we’ve been traveling for; most of the guys had been wandering around for about 4-6 months. Damien, [a former civil engineer, from Australia, after working for only 3 years, quit his job and] has been bicycling through Asia for the past 16 months. It was awesome to talk to these people from Australia, Japan, France, Switzerland, Israel, Austria, Germany, and of course India. That’s actually something that has been pretty consistent on my trip; at all of the Buddhist sites and throughout India, most of the ‘Asian’ backpackers and tourists have been from Japan. As I would walk down the streets, the shouts of Konnichiwa in broken Hindi accents would come from smiling local passer biers. As fortune would have it, I ended up with a single room; this helped so much during the course as I wasn’t tempted to break the Noble Silence and I didn’t have to be distracted by snoring or any other bodily noises. Every morning the wake up bell would faintly sound off; echoing into my deep sleep. I quickly became grateful that [my roommate] Claudia, had recommended that I pack my softer hoodie, as its warmth comforted me during the very chilly mornings. While waiting for the 4.30 [meditation] bell to ring, I came to really enjoy walking up and down the walking path, glancing up at my old trusty autumn friend, the starry constellation – Orion. The stars were so bright in the morning darkness; I remembered my forgotten appreciation for this, [the dark calm beautiful silence experienced] during my past ‘lives’ as paper boy and as a Soldier in the Army [Basic Training]. The morning meditation was the hardest, at first, as I found myself so tired that my body and mind just wanted to sleep. The slouching back and the bobbing head always snapped me out [of my slow sleep, that is] until torpor would over take me again. This was my morning meditation; by 5.30 or 6.00 I began feeling [more energized and] ‘awake’ enough to actually practice. Breakfast was such a Samkara [ref. as self realization of attachment] of pleasurable craving! Hot cereal, warm sweet rice, hot chai, fresh fruit… these are already good as a breakfast, but when one hasn’t eaten dinner, breakfast [becomes the literal term and] turns into a much needed feast. The break times after the meals were also comforting. Sitting for about 10hours a day, in the beginning, really [hurts and] brings a lot of pain; causing me to wonder what good the cushions do. These breaks not only allowed us to have time to our selves, but to also rest our legs. Never in my experiences in playing soccer or in Basic Training, have I felt pain like the pain I felt in this course. My knees, calves, ankles, and lower hip joints all felt as if they had hot knives thrust upon them. Surprisingly, with each nights rest and the 15minute breaks, the leg pains would subside and overtime, almost strengthen the legs… This is important later. For the first three days we were instructed to, by the old [audio] tape recordings of Goenka, to focus on the breathing, Anapana Sati; the awareness of the [breathing] sensations from the nostrils on upper lip. The reason one focuses on the breath, is to learn [and develop an awareness], through direct experience, the changing thoughts that arise, the changing sensations on the nose, and the different ways one naturally breathes. The breath is such a neutral bodily experience, something we have to do to live, something we do [and are often] completely unaware of, and something that is with us, until we die. Training the mind to focus and to become calm, all by learning from something [that is] so simple and that is always with us, is comforting to me… even now. By the end of the third day I had become very aware of the arising and passing of [all of the enormous] itches, pulsing twitches, cool inhalations, and warm exhalations [happening around my nose and upper lip]. Vipassana is taught by using the ability to focus on different parts of the body to see what comes and goes, slowly scanning bit by bit. The sensations that arise, good or bad/pleasurable or painful, get noticed as the mind scans parts of the body; [learning] not to react, judge, or bring craving or aversion into the picture (samkara) is the real practice. Thoughts are also worked on the same way. I think this area or part of the meditation [practice] is by far the most challenging. All through this trip my mind has developed thoughts of worried doubts which caused stress through angst and fear. The idea of facing and understanding my thoughts, or just being able to see how the deeply rooted memories of the past can bring up feelings of craving or aversion [is a very challenging thing for me to do]. Generally there are two types of thoughts; thoughts of the future (fantasies), or thoughts of the past (memories, real or exaggerated). The mind doesn’t seem to enjoy being in the present, very much. My mind seemed to have ordered premium cable as every time my mind wandered, it would be on a new channel of the ‘this is your life’ network. Whenever a new channel would come on, the idea would be to catch the thought and to compassionately bring the attention back to the breath; often I would be pretty good at bringing it back right away, other times I would have gone through 3 or 4 channels before realizing my monkey mind had swung away. One channel that kept stubbornly coming back was the relationship channel; the fights, the happiness, the intimate moments, the insecurities… of every girlfriend. At first, it felt just like all of the other thoughts that would arise, but I began to struggle trying to return my attention to the breath… it was just too much. I began having dreams… Frustration began developing. It began to become more and more apparent that I was handling this thought pattern with such aversion. Admitting a part of it was me not wanting the intimate memories to be played in my mind while I was meditating. After realizing that I was avoiding the present and fighting the built up overly dramatized memories that were causing me to suffer, I did something different ‘crazy’, I allowed the thoughts to just play out. What happened next was pretty interesting as I was immediately put into a deep stage of access concentration, a level in meditation of total awareness; I found fear was the root cause behind these memories, fear of the emotional harm caused by clinging to each relationship only to feel abandoned; the guilt that followed due to feeling like I had done something wrong in each [relationship] and feeling that I wasn’t deserving of true happiness. This channel was showing me something that I’ve buried and avoided for such a long time. With each breath of calmness, I applied the idea of impermanence of all things, anicca; with compassion, I allowed the fear to arise and to pass. This channel no longer appeared the remainder of the course and hasn’t since I’ve come to face it, one week ago. The experience and insight I’ve gone through cannot be put fully into words. The only thing I can say is that when the course was completed, I had gained more of an understanding on how I relate to thoughts and sensations that are both pleasurable and aversive; [this does not mean that I am free of stress, but rather better equipped to handle it]. The leg pains were the steady reminder that physical pain and the aversion that is associated with it, also passes with awareness. By day 4, the guys’ side of the Dhamma Hall had some of the most creative cushion layouts, as we started to figure out which way to sit that brought the least amount of physical pain, based on each of our direct experience with it, paññā at its best. When it boils down to it, the direct experience of wisdom is what makes morality and discipline work; these make up sīla, samadhi, and paññā, the three categories of the 8-fold path. On the morning of the 10th day, the noble silence was lifted. The camaraderie, having gone through and (seeing everyone else) persistently making the effort and getting by, was silently formed over the course and was well vocalized with the shouts of ‘congratulations!’ to one another, the moment we stepped out of the Dhamma Hall. This was followed by sharing our individual experiences, often discovering and laughing at how similar our challenging mental experiences were. We all felt different. This, considering most of the guys had little to no experience with meditation or with Buddhist philosophy. I found myself explaining what the Brahmavihāras are all about, after the very brief closing Metta meditation. We were later shown the documentary, Doing Time, Doing Vipassana, a film I had heard so much about [which was heavily influential to the program developed for the film The Dhamma Brothers], showing how Vipassana was introduced as a way of rehabilitation in a maximum security prison in New Delhi, and the impacts it had on the guards and inmates. There was something so powerful about seeing the two ‘opposite sides’ [militant guards and hardened inmates] embracing [after the course]; a method of true rehabilitation being applied to a system, which in my opinion, is full of flaws… You cannot heal or expect to reform by using tactics of hatred and enforced fear. The remaining time was spent sharing where everyone was off to next, rejoicing over the announcement of Obama’s election victory, and trading contact information which got some to continue talking about where they were from and how long they have been on the road. I particularly enjoyed talking with the guys from Japan, [Aki and Yoshi] as they were so curious about NYC. [We bonded about how we grew up playing rockman (Mega Man) as children, and how we are fans of the indie punk band from Japan, Thee Michelle Gun Elephant]. I extended the offer to all of the guys that if they are ever in the states and stop in NYC, to look me up. I shared an auto rickshaw with Alyn, from Israel, and the guy [who I can’t remember his name, sorry!] 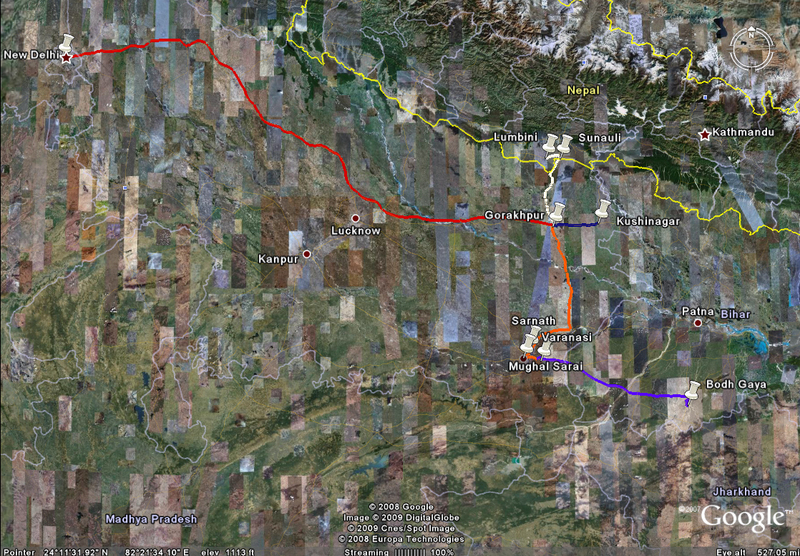 from Switzerland, back to Bodh Gaya. Upon exiting the tuk tuk, I heard the shout of, ‘Hello Brother!’ turning around to see Nikesh; he was heading to the bank. I told him that I would meet him at the school later. It was good to see him again. I said my final farewells to my ‘Dhamma Brothers’ as we all went on our separate ways. I made my way back to the Deep Guest House to drop off my rucksack and decided to go back to the Mahabodhi Temple to pay my final respects; I wanted to try to pick up some fallen Bodhi Tree leaves to give to Sam and Rachel, two people who have been such wise friends to me this past year… as I approached the temple grounds I remembered how expectation does not bring happiness, [if I get them, I get them. While I was circumambulating around the temple, a large leaf dropped from the towering tree, right in front of me. Bending down I caught from the corner of my eye, several hopeful practitioners suddenly racing towards the leaf, only to stop in their tracks as soon as I picked the leathery brown leaf, from the ground; smiling, I carefully slid the leaf into my saddle bag. It wasn’t that those things bothered me at all before but it was like I was detached from everything around me. Perhaps I have gotten so used to the life in Bodh Gaya, that it was truly time to leave. As I walked up the steps to Ao Zora, I was noticed and greeted by the lady landlord who ran the store in front. I walked through the curtains and suddenly the attention of tiny little eyes were fixed on me, and with a loud chorus of piercing off beat shouts, I was welcomed. Tinku greeted me, smiling, asking me how my meditation course went. Understanding that my presence was causing an excited distraction with the younger classes, I followed Tinku upstairs to say hello to the other classes and settling in on the classes 4 and 5’s math lesson, being taught by Vinod. The older kid’s attention were much more focused on the word problems being written in Hindi, where as my attention was fixed on observing how different they looked; all the ‘Ao Zora Boys’ had all gotten haircuts! While my return visit to the school was incredibly short, it was so good to be able to see all the kids, one last time. A meeting was held between me, Nikesh, and a local lawyer, whom was able to give advice and hear the plans on having a potential project started with EWB. The meeting concluded when we were all in agreement on how they would proceed and that they would keep me updated. The meeting had also run a little longer than planned, as both the lawyer and Nikesh realized that my train departure time was rapidly approaching. Nikesh quickly gathered all the ‘boys’ and I found myself suddenly surrounded. The ‘boys’ each gave me good-bye cards, orange construction paper covered in googly eyes and crayon writing… the supplies I had brought, that were a gift from me and friends from NYC, were used to make the emotional confessions of each brilliant boy. Two bright orange flower leis were placed around my neck. Suddenly I found myself in a shower of flower pedals, being pelted by all the children, as cries of ‘Thank you!’ and ‘Good-bye!’ filled the air, followed by hugs and flashes from the camera. When I left the school to head to the Vipassana Course, I was choked up and had teary eyes as I said good-bye, one by one. This time felt much different, no sadness, only happiness-knowing… seeing how much I had helped, and feeling the energy of love and gratitude. This truly happy moment will be with me, the rest of my life. I said good-bye and thanked Tinku, Mukesh, and Vinod, hugging each one, and then climbing into my waiting transport. Picking up my rucksack from the Deep Guest House and placing it into the back of the auto rickshaw, Nikesh and Amid began expressing to the driver and his ‘co-pilot’ how they MUST get me to the Gaya Junction Rail Station on time, as the rickety metal chariot sped off quickly, leaving a dusty Bodh Gaya behind us. Sitting in between my two friends, I could tell they were definitely nervous, as each took turns checking their mobiles to see the time. It was almost humorous to observe how their mission became to worry about my potentially missed train; they began yelling at cyclists who were in the Tuk Tuks way, the passing cows, and eventually at one another, as Amid’s mobile revealed to be 3minutes ahead of Nikesh’s mobile. The whole ride I gripped tightly to the piped roof frame as we barreled down the tiny and windy village roads. Not once did angst arise, nor did any fear, anger, or panic. Only calmness, attributed to my recent experience, allowed me to see that freaking out, as my friends were doing, wasn’t going to get me to the station any faster. If I missed the train, I missed the train; one extra day with my friends in Bodh Gaya! Right? Another part of me had to also laugh at how much I had changed from my experience on this trip. I think I would have been right there with Amid and Nikesh, arguing as to who’s mobile has the correct time, or who can shout at people in our way the loudest. I also understood that Nikesh, being the gracious host, felt as if it was his responsibility of getting me onto that train. He also felt like it was his fault that the meeting had gone on much longer than expected. I’ve been in his shoes before. I leaned over, putting my arm around him, and thanked him for being such a good friend; assuring him that we’d be OK and that it was I who was leaving, not him. We made it to the crowded station with 6minutes left to spare. I strapped on my rucksack and followed Nikesh, who had taken off racing up the long stair overpass and back down to the platform through the sea of travelers, when he suddenly stopped. The train was an hour late. India Time! [Oh, how I have forgotten about India Time! Trains never leave or arrive on time!] You have to add time onto any timetable. As the train slowly approached, the platform became a frenzy of people pushing their way to board the train, all at once. 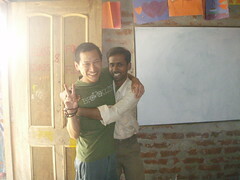 I embraced Nikesh and Amid, thanking them for being my friends, and said good-bye. Exhausted, I climbed up onto my bunk and passed out.